What would you say to Nokia Africa? On Friday I’ll be addressing some of the top business decision makers for Nokia in Africa. My goal is to shake them up a little, make them think deeply and differently about the African market. 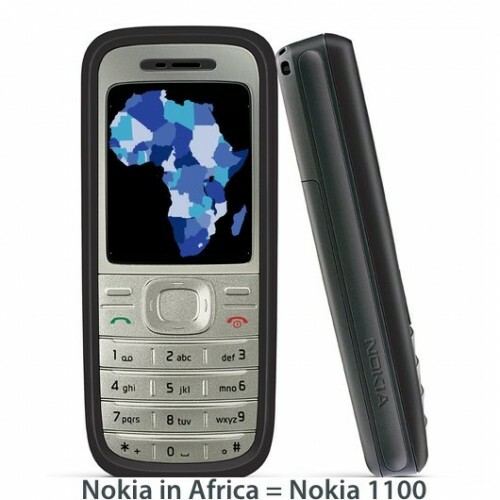 Nokia hasn’t truly innovated in Africa since they put a flashlight in a Nokia 1100 in 2003. I’ve been asked to discuss my views on how the handset and mobile services business situation is developing, what the opportunities are in those areas and suggestions on how Nokia could lead in this market. Therein lies the problem: I’m only one person with one opinion, they need to hear from others with different experiences. Here are a couple from Twitter. Is Nokia serious about social impact, or is that just face paint? Africa is ripe for experimental phones and financing models, what is new coming out of Africa first? Don’t just think cheap handsets. What else would you do within business models and solutions? They should make a solar powered low cost handset for use in rural areas. Use their reach and size in emerging markets to standardize the OS/UI for mobiles – that’s still wide open and it will help with the contextual knowledge/mediated use issues that Chipchase has recently discussed. Everyone knows how to send an sms or make a call with a Nokia regardless of model, that’s not true of most other brands. I have more radical suggestions but a modest one would be to encourage Nokia to be the first to implement 802.21 in their handset to allow seamless handover from WiFi enabled handsets to GSM/GPRS. Enable the native phone directory to dial VoIP calls when WiFi connected. Build a great integrated SIP client into their phones. Also look at IEEE 802.11u to facilitate billing handover across networks. Lead the charge to fully IP-enabled phones. Oh yes, and no offence intended but please stop colluding with the mobile operators. Time to start colluding with the customer! Remember how you created a special WiFi-less phone (the infamous E62, yes I bought one) for the North American market back when the operators still thought WiFi might be bad for their business model? Not to mention phone locking. I wish there were a really separate website for Nokia in Africa, and that its pages didn’t take so long to load… Plus a good inbuilt browser in web-enabled phones, not the rubbish that certain mobile phone operators with a continent wide reach want to foist onto us! how about a nokia powered cloud based tablet with focus on cloud based apps? Or maybe more realistically a platform such as microsoft’s oneApp that runs cloud services? I believe Africa is an Emerging Market in more ways than just investments, especially in the arena of innovation. I believe Africa is a big sized lab for the latest innovations for both high-end and low-end kind of phones and Nokia has the perfect opportunity to make a huge difference for the ordinary masses especially in researching, mapping and funding apps that relate to health, agriculture and finance. hence my query to them would be…what are they doing on the research front? what local companies are they partnering with to collect data that can be used by techies and developers? Get an Android based Nokia Phone – If you can’t beat them , join them . Unlock my location information. Make it available on screen and easy to message to others. Am with Niti – one OS or at least UI for all phones. Else: Reduce the number of phone models currently on the market; capable browser on all phones; lots of RAM for browsing; low budget QWERTY phone with Bluetooth for all of those who are using the phone as a digitale safe for their digital media; real USB jack that pops out (= no cable); removable solar back cover; flashlight; better online support for low end phones + backup of their data OTA & via the mentioned USB jack; adopt concept of different user profiles (phone books) on high end phones; multi sim (2-3) – the Chinese can also do it and obviously, there is a market; dust proof like the legendary 6250 or 5140; location based services (via A-GPS) even for low end phones & support via the OS; implement the recent innovations from Beta Labs – who else shd test them? The US and Europe are on Android and iPhone OS anyways…. And: Work on Ovi Store. I think in 2010, it’s all about the software. Then: massively push mid-range touchscreen phones & offer the 100 most popular iPhone apps, ported to S^3 & Co.
Is Nokia a hardware maker or a software maker? Few suceed at being both well. I believe hardware is their best strength. Nokia needs to win the developers back but between Symbian, Meego and Maemo Nokia’s platform seems to be a mess. Time to harness the power of good software with excellent battle tested hardware at the right price. Android Powered QWERTY handsets at Nokia’s usually great prices. $15-level phones with GPRS / faster data. Oh yeah! One more thing. We’re a little tired of reading about nokia innovations other continents then getting them here centuaries later. I want OTAs for my e71!!! my favourite dream – many still have a phone in their pocket with little airtime, especially learners and students. why not provide SD cards with reference books, encyclopaedias, textbooks and much more so that the device becomes the equivalent of the powerful computer it could actually be. Services and information don’t always have to be on the cloud, and this is an area that’s been overlooked. For all the great advances in pricing and technology, there is an opportunity space here imho and not just across Africa. Someone said above phones are being used as default data storage devices… where are the apps to manage that intuitively, for eg? where’s the means for a jua kali artisan to create a portfolio of his works ? Question: Does the “predictive-text” program come pre-loaded into the phone (i.e. by Nokia or Motorola), or is it added later on by the carrier (i.e. Zain)? If it’s the former, I’d love to see more work done on loading natural language algorithms and word lists from local languages – not just English, French, Portuguese, etc. When I have to send a text in Chichewa (here in Malawi), it takes far too long to punch in the message. Furthermore, I believe the adoption of local languages in predictive text programs could potentially do a lot more to solidify the orthography (proper spelling and form) of languages among their speakers, than years and years of school. There are plenty of linguists already in place throughout Africa, in every country, for just about every language, who could be recruited in such an effort, whether undertaken by the hardware manufacturers (Nokia et al) or the mobile companies. (Just to be clear, I’m not dismissing the value of education here; just saying that if somebody uses their phone to send text messages on a daily basis, using a predictive-text tool, that person will very quickly become accustomed to the correct orthographical patterns of the written language; in my own experience, predictive text in English has actually improved my own spelling). My suggestion a bout Nokia is to try what they can to prevent fake Nokia on Market. In Uganda 90% of people use Nokia but those who Use Original Nokia are like 10% because they are very expensive. its good to Use Nokia because its user friendly to even non educated people but they are being duplicated at high speed. I’d suggest that many of Nokia’s problems are organisational rather than technological (they do still, after all, make pretty good phones). Adding a few features here and there to a device won’t necessarily solve their increasing slide across the continent. 1. Stop treating the Middle East and Africa as one sales/target region (they may have stopped doing this now, and if so that’s good news). I’ve met Nokia people in the field, and they realise that it makes little sense to bundle such a massive geographic area together. If Nokia are serious about Africa they should treat it as one region, and even go as far as dividing it into north, central and southern Africa. 2. On more occasions than I care to remember, Nokia staff have been keen to engage in our work with FrontlineSMS, but have then found they need to speak to a whole raft of line managers before anything can get done, or they simply can’t find the right person to speak to (the person who’s “ultimately responsible”). Nokia is a large company and they seem to be slow, heavy and burdensome when it comes to responding to opportunity. Google manage to do it – Nokia should look at their corporate culture, and the kind of people they attract, and learn to be more open and responsive. To me, Nokia seem highly efficient and reliable (perhaps as a result of their Finnish roots), but Google has the ‘buzz’ and seems to attract the more creative, off-the-wall talent. 4. They should seriously look at investing in start-ups and other entrepreneurial activity across the continent. They should take some of the big money they’re throwing at high-profile global social change/technology competitions, which generally attract western organisations, and do more smaller-scale work at the grassroots level. They need to send out a strong message that they’re interested in the voice of their end-user, not just for commercial reasons, but because they care about building devices which positively impacts their lives and helps connect them to people and information. 5. Staff responsible for the Africa region(s) should have an element of social change/local initiatives considered as part of their yearly targets and measures. One of the bigger problems is often a lack of incentive to put the time into understanding or helping early-stage initiatives because this stuff isn’t measured in any way. Today, it all seems to be about maintaining margins and market share. 6. Finally, as a simple starting point, Nokia need to look at the continent and see what’s working and what isn’t. To a large extent, Google have seriously engaged local talent in ways Nokia haven’t by including them in mapping and other tech initiatives (whether you agree with this or not). “Tech empowerment” is going to be key, I’d say, if Nokia are to get through this difficult spell. @ Ken: I know for a fact that Nokia are still treating Africa and ME as one region. What’s worse, their policy is to only make ‘volume’ products for the entry level of the market, meaning models that sell at least 1mm units a month, like 120x series. This 1mm requirement means that Nokia are unwilling to try anything that may prove to be a niche product, and thus they are not in the business of user-centric thinking in Africa.. This requirement means that Nokia are unwilling to try anything that may prove to be a niche product, and thus they are not in the business of user-centric thinking in Africa..
Nokia needs to develop faster development processes to keep up with the rapidly changing mobile space in Africa. Small local development teams that are given a greater degree of flexibility and independence could fast track new ideas that are relevant and deliver value. echoing earlier posts – fewer handsets and O/S and APIs in an effort to standardize app development. promote the OVI store amongst local developers. again, any radically new products or services would need new business models to support its proliferation. Oh man, just one day after this, Nokia announces these great phones http://www.intomobile.com/2010/06/03/nokia-launches-their-first-dual-sim-capable-mobile-phones-c1-c2-plus-two-more-low-end-devices.html – with dual sim and some other mentioned concepts. The bicycle charger – it shd be open and/or will else be rebuilt by the jua kali sector . Dying to cover this on AfriGadget once we have our own version! @Ken: I think Nokia is like Volkswagen – good engineering, but too big, too bureaucratic. I like this detail you mentioned with the performance contracts – engage staff and give them incentives. Could also be a first step. @Niti: the digital storage safe could be what unites the worlds, because kids here in Europe use their phones for exactly this purpose (and not calling or sms ), but theirs is often just content storage, not creation, unless there’s a camera. And I agree, there shd be a way for artisans and others to easily publish their work online using phones. Connected to an auction site for fundis, so when a customer needs a hardware job, artisans can send in their offer and/or advertise their business. Something with multimedia content, not only SMS-based. @Erik: I think what Nokia needs to understand besides of the strategic details Ken mentioned, is that even the low-end phones will need to come with a better software so we can get away from this SMS-only/Java applet level. Not because they are too limited, but because the phone really substitutes the otherwise non-existing computer and shd therefore offer more flexibility. @Rik – Sad to hear. When you think about how different those markets are, it’s crazy. And when I was last in East Africa, they only seemed to have about six people on the ground there. Actions speak louder than words! Another big almsot missed boat for Nokia is mobile payments / mobile money platform. I believe Nokia has investments and might even be a major shareholder in such a platform (Need to check my facts). Ovi + Mobile Payments platform may finally allow devs in Kenya to sell apps to me in Accra with less barriers or vice-versa and that would excite a lot of people in Africa…. Seriously though, a standard platform across the board, plus standard UI as JKE stated, and strong api’s. With this done they can get out of the way and let folks innovate… End of story. I’m not too late to the party am I? 1. First off…thank you for standardizing the data ports to the Mini USB standards. Now please take it up a notch and allow us to use the same port for charging the phone. Everyone else does it…i’m sure you can too. 2. Taking cognizance that this the dark continent, solar powered phones or chargers that use movement would definitely keep Nokia at the head of mobile user adoption. 3. On smart phones and the app store….local contextualized apps and content will always win the day. This means partnersing with learning institutions and growing a developer base for Symbian and any other OS Nokia may look into running with. It’s too bad that Nokia are suffering as a result of their own ingenuity. 5 years and back, Nokia ruled the market scene by continuously innovating where their competitors didn’t see the need. They believed in emerging markets when no-ne had heard about such a thing and they made devices specifically aimed at this. Today, Google’s Android and IPhone are beating Nokia at their own game. Android particularly has grown because of how swift they are at innovating and delivering the innovation to the end user. Am sure Nokia have their numbers in hand, what they don;t seem to have is the meaning of this numbers. Granted, Nokia are good at making excellent hardware. They pioneered the idea of a standard OS with their Symbian platform. So here’s the deal. Everybody agrees that the future lies in software. b) Adopt the free Android, give it support and backing as Google have done and obliterate the IPhone. Personally, I’d go with the second option because Google are not interested in selling hardware(read phones). They are interested in creating a standard platform out there that they can push their services through. They want a piece of the mobile internet action. If Nokia had a versatile OS supported by an innovation leader(read Google), the only thing they need to focus on is building better hardware for there phones. Wow… I’m impressed everyone, so glad that I opened this up to all of you to give in some ideas as well, I would not have come with half of these. Voice activation for calls on the cheapest phones? I’ve observed a number of people (mostly in rural areas) needing help to use their phones because of not being able to read the names in the contact list. This includes people in leadership positions at the local level. Two words: Battery Life. What is the general direction of their innovation towards longer battery life. @rik Do you mean standardized OS/UI and customized niche services? What about current nokia ovi store. Is it easy to use and serves emerging markets mobile users? or should it look more like http://www.jalumba.com/… to facilitate application sharing? I’d like to hear from all of you in Africa if there are any other serious contenders to the role Nokia has played/is playing among those who need reliable, durable, simple and easy phones at an affordable price with a resale value and long life? I am curious at what their thoughts are with regard to Smartphones especially since they were to cut their production of smartphones by half in 2010 – http://gizmodo.com/5418797/nokia-to-halve-smartphone-production-in-2010-official-suicide-watch-starts-now. Not sure if this was mentioned above as I didn’t read all the suggestions – my apologies if I’m being redundant. I’d love to see Nokia work towards embracing Android and pushing hard to lower the cost on phones with the ability to run these apps. The next big wave of innovation in mobile at the BOP will be driven by smartphones/apps and the cheaper we can get phones that can run these kinds of programs the faster we will see creative solutions in these markets. Frog Tek and Veritas Vision(PerfectSight) are two great examples of innovation in this field. -Talk to us, then listen. Thank God they invited Hash(who is actually wat Nokia should be doing, talking with the users), but he is just 1 guy, so many comments and i’m sure they have given him a time limit for his ‘little speech’. Magic word: customer feedback. -forgot my 2nd point while struggling to type the 1st one on my 6300. Anyway, good luck with the meeting, Hash. Don’t underestimate the value of a torch in areas with unreliable electricity! I am also very fond of my Chinese-made dual-sim phone with its built-in radio aerial. We are scheduled to release Swahili & Sheng Apps for s40 and s60 Category mobile phones in Kenya shortly. This post has been a great help in understanding the issues and challanges we phase. In my view Nokia is the best suited Phone company as they have a wide range of phones and platforms for developers and users to interact with. The challenge is finding the right mix. For more details email tribe(at)whive.com. We look forward to more suggestions. Users want music, video, camera, entertainment and the ability to sometimes get info — think about how you use your smartphone. Users want to operate their phone in their own operating language. Nokia needs to expand the language options beside those of South Africa, Nigeria, Swahili, Amharic and Arabic (might be missing some non-Europeans). Nokia could easily crowdsource the localization into every language possible, and then allow users to update their language menus. Nokia is laying the groundwork to do this in conjunction with the WorldBank’s infoDev, by setting up app labs in Africa, Eastern/Central Asia and Asia. Nokia needs to make sure its phones are capable of adding these types of apps. Nokia should also engender innovation in profitless apps, apps developed for those who earn less than $5/day. +1 for @JKE on the bike charger. Would like to see Nokia drop the pricing to an affordable range for widespread African use, and sell the kit without the dynamo since many African bikes already have functioning dynamos. remind Nokia that access to Internet is very expensive from many countries in Africa. Nokia website, updates, mobile apps should be optimized for this. In my experience, so many US and EU companies forget that many Internet users do not have a flat rate and need to pay $$ for every MB downloaded. Long lasting battery is important. 1. I would like to support Steve’s comments – on user costs for voice and for data, I think this is the biggest impact nokia could make. 2. Ive worked on a project with Nokia South Africa, so I’m not sure of the situation in the rest of the continent, but my experience is that there is almost no technical capacity here. All R&D issues were passed on to far distant teams. Wouldn’t an interesting start to engaging with a number of issues that others have raised here be if Nokia committed to establishing an R&D team located on the continent? They need to re-think and re-work their Ovi platform to work in Africa and for Africa. White-labelling might help, tie ups with telcos and local content producers and they need to figure out how to make it more meaningful to the ‘mwananchi’ (common man) who probably longs for rich and innovative communication interfaces unlike Ovi Mail. There are two things I’d ask Nokia for- a battery that lasts two weeks on a single charge, and a simple SMS to email (and back again) platform so that rural Africans can have affordable communications with business contacts, family and friends living overseas. Wow, what great ideas and a wealth of knowledge. I really enjoyed these posts. Nokia has been doing work in Africa already… it is just relatively slow and seems to only come in short bursts. I recently started running a mobile applications lab with MIT and Nokia under the EPROM umbrella. But, looking at the history is this… EPROM started in 2006, there was some cool activity; a couple of universities jumped on the bandwaggon; a number of apps came and I think I recall SMSmedia came along around that time… however, it relaxed every 6 to 8 months… 2007, 2008 (almost nothing), 2009 (still not as active as 2006), 2010… almost nothing. I actually decided to set up my own lab, but because the EPROM curriculum seemed to fit perfectly with Africa’ s need of apps, I took it up and added a few of my own adjustments. Nokia never gave support until just a few weeks when the EPROM coordinator (founder), Nathan Eagle, got in touch with me and told me that NRC in Nairobi would be sending me a couple of phones my way. Iteratively add more features to your app… please research the solution and how a particular need it addressed. A story is told of a Soviet aeronautic engineer who designed a magnificent plane. The test pilot came to take the machine for a quick spin in the air, but when the pilot entered the plane, he never took more than 4 minutes in it. He disembarked, walked up towards the engineer, shook his hand and congratulated him for building this perfect piece of machinery. But there was a “but” in his statement to the engineer: “…,but, if you can give me a third hand, I’ll gladly use the two that I have to steer the plane, and my third hand to pull the lever…”; the gist of this story is design things/applications that will work for the community. Well… if you have a good product, people will always follow, companies will invest in it, and life will be fun… good products change lives. Nokia will know that.. and it will provide more support… this is still the same with other companies. 🙂 thanks. Nokia should establish a factory in Nigeria because Nigeria is a big market. So, why should Nokia produce elsewhere and ship to Nigeria instead of producing in Nigeria? It should consider setting up a production factory in Nigeria in order to create employment for citizens of one of its largest markets. How far can Nokia Africa help reduce the unemployment level in Africa? i am late to this post and figqure suggestions have already been taken. But here goes. Nokia already has an OS [Meego] for this and this should not be too difficult technically to accomplish. Nokia should adopt a more African-like shape and colour for their phones. simplicity always wins in Africa, i can show u how.